I knew it would be a tough run because of how I felt in the first few minutes. Because my GPS took longer than usual to find the satellite. Because my heart rate was much higher than it should have been. Not a big deal. But I could feel it in my stomach and chest. A little too full. A little tight. I knew I hadn’t eaten enough the night before and that I was probably running a little too close to breakfast. The promised rain and snow had not yet materialized and I wanted to get the run in before the weather turned for the worse. I ran past the ski track. Through the wealthy neighborhoods of Wellesley, out to Route 16 and all the way to Wellesley center, then worked my way back along the marathon route. My tempo was good. I was accumulating miles and passing other runners, running in small groups or singly. I muttered a brief “on your left” or “on your right” as I snuck by on the berm of the sidewalk or with a hop into the road. Otherwise, I spoke to no one and listened to Soma FM Indie Pop Rocks for the duration. I borrowed some Gatorade from DFMC in front of Marathon Sports. I crossed into Newton and started the first long grind up and over the highway to the hospital. I took some more liquids at the fire station where the course turns onto Comm Ave. I forced myself to eat a gel. An hour and half had gone by and it was the first food I was taking. Then I picked up the pace. For the next half hour, I ran hard, slightly faster than my marathon pace, up and over Heartbreak Hill, to Boston College, and back, heading home, heart rate pegged at the upper end of the 160’s. I was starting to feel cooked. That was the plan. Try to simulate the end-state fatigue I would encounter during the race. I could the feel the blister starting to burn under my left foot. A stitch had formed on my right side. My neck hurt like hell. The final half hour should have felt like a gift. A reprise to run at a slightly lesser pace and to enjoy the fatigue and the end-game of my longest training week. Instead it was a forced march through the neighborhoods of Newton, fighting to maintain a steady pace and absorbing the suffering best I could. I made it home on fumes. The legs felt good but the rest of me was bone dead. I was dehydrated — I lost 5 pounds on the run and had burned 2000 calories. I just wanted to go to sleep. I forced myself to eat and drink. Then I took a good nap. It was a long week and my longest of my marathon training plan. 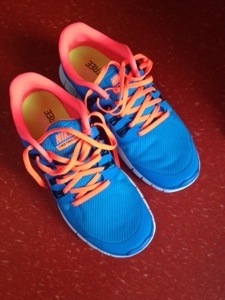 I ran four days: 10 miles, 13 miles, 5 miles and 22 miles. I will taper from here. Today was pretty much my last ski of the year. I ended it where I started it — at Weston Ski Track. It feels same shameful to stop while there’s still so much snow on the ground, but it’s go-time for running. I even took the roof box off my car. I skied a few easy laps. I was a little tired from yesterday’s long run. Just a little tired. I felt much better than I expected. I skied with my friend, Tom. I’ve known Tom forever. I met him while I was racing bikes in France in 1991. We lost touch. About 15-20 years went by. Then a few years ago, I saw him skiing around Weston. After all that time, it took us a while to figure out we knew each other, then we were back skiing and biking together. A good ski with a good friend. And a good way to wrap-up the season. 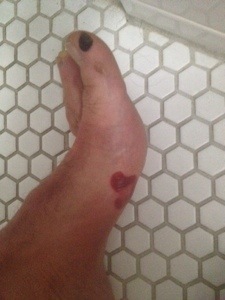 And all I have to show for it is this giant blister. I ran the 20 in 2 hours and 18 minutes. A little faster than I expected but I ran at the pace I felt most comfortable and that’s what it got me. The last 2-3 miles I started to feel tired and had to work to sustain the pace, but it was all good in the end. That’s pretty close to what I have to run on race day to go under 3 hours. Assuming I get this blister under control. Winter is still holding fast at Weston Ski Track. The Tuesday Night race series was wrapped up — I somehow managed to win it again for the second year in a row! But I had missed the costume race and awards last week — I was still in the air on my way back from Malaysia. I was pretty much done with ski season. And probably should have stayed clear of any more skiing. But tonight was a bonus. A race during daylight. And still some pretty good snow. But I didn’t last too long. My skis got lost in deep snow on the first hairpin. I spun out. I felt a sharp pull in my right leg. I went down and had to wait while skier after skier skied over my pole. I managed not to break it. I got back up. I started skiing again. But I was pretty much done. I have less than six weeks to go until the Boston Marathon and I’ve managed to stay injury free. I wanted to keep it that way. So I skied a lap or two at the back. Skied a bit with my son who was doing his first Tuesday Night race. Then I stood on the side of the track. Watched the Harvard boys ski away from everybody. Wondered if I’d have been able to keep up with them. It was nice to watch the race. For a change. It’s been good ski season. All things considered. It’s been good. 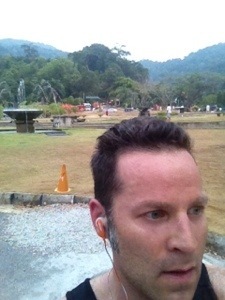 I’m in Malaysia for work for a few days and need to stick with the marathon training program. It’s quite the sudden change from the snow and polar vortex of New England. It’s 95 F right now and was 80 F when I ran this morning. It was dark for the first hour. I ran along the waterfront by the hotel. Back and forth on the mile long frontage. It felt like an old video game. I kept encountering the same obstacles: the old Asian man in white polo shirt, flapping his arms; the old Asian woman shuffling along and drifting side to side. The guy on a scooter on the sidewalk. Every so often there was a cute, spry young lady. That was extra points. A power up. 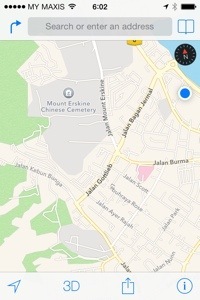 Once it was light out, I ran up to Penang Hill. The steep trails were closed due to fire danger. Penang is in the midst of a drought right now. I ran around the Chinese Cemetery, startled some cows, and headed back to the hotel. At the end of it all I had run all 17 miles I needed to and preserved the plan.